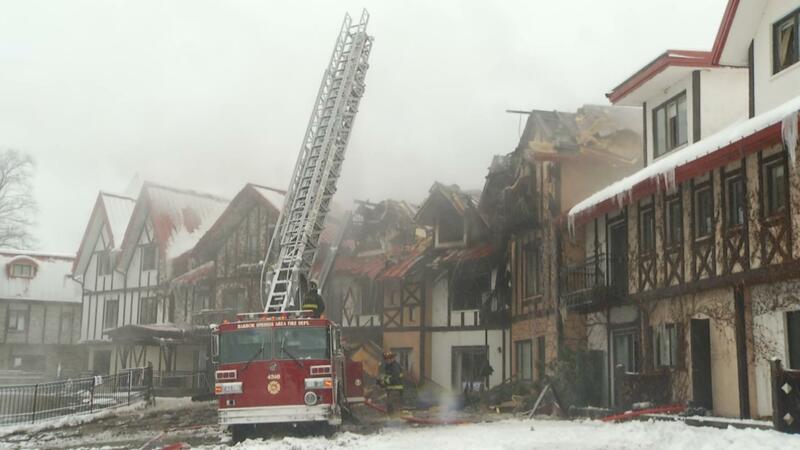 HARBOR SPRINGS, Mich. -- A fire at the main lodge at Boyne Highlands, a popular ski resort in northern Michigan, injured 12 people and forced the evacuation of dozens more early Sunday. The resort said the injuries didn’t appear to be life-threatening, although one person was taken to a hospital about 180 miles away in Grand Rapids. Boyne said 40 percent of the lodge has some fire damage, and much of the rest of the building was affected by smoke and water. There were 113 guests in 64 rooms. The fire was reported around 1:30 a.m. Sunday at the lodge in Harbor Springs, 75 miles northeast of Traverse City. The cause was under investigation and the resort was closed. The Harbor Springs Fire Chief said the cause of the fire is under investigation, but it is suspicious, CBS affiliate WWTV reported. “There was smoke billowing all over the place,” said local photographer Alex Childress, who drove to Boyne around 3 a.m. when he heard about the fire. General Manager Mike Chumbler said staff went door to door to ensure that guests had been alerted. They were moved to lodging elsewhere at the resort. “We, as a resort, in the last year have gone through a mock fire scenario. ... I’m proud of our response and that the team stepped up. It was good that we practiced like we did,” Chumbler said. A lodge guest told WWTV that security knocked on the door. “I was like, I can smell the smoke, so I figured that it was bigger than just a safety evacuation kind of thing. Then when we got outside and there’s just smoke everywhere and then you could see there were things that were falling down from the sky,” said Emily Hanford. It was Boyne’s third weekend of the winter season -- and a snowy one. “The weather was just turning for us,” Chumbler told the Petoskey News-Review.